Rome Italy is home to many world-famous landmarks. They include Piazza Navona, Trevi Fountain, the Pantheon and the Spanish Steps. 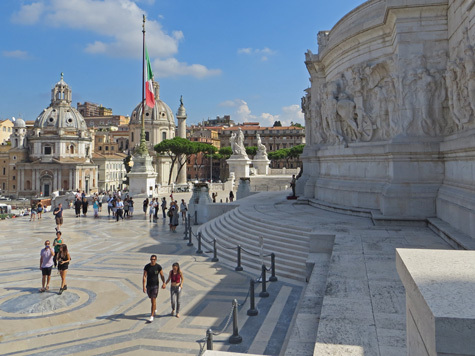 Top tourist attractions in Rome are Neptune's Fountain, Trajan's Column, Borghese Gallery and the National Gallery. Visitors to Rome should plan to spend at least one full day in Ancient Rome. Top attractions are the Roman Forum, Palatine Hill and the Colosseum. Vatican City is home to St Peter's Basilica. Don't miss the masterpieces by Leonardo da Vinci and Raphael at the Vatican Museum! Rome is served by two large airports: Leonardo da Vinci Airport (Fiumicino) and Ciampino Airport. There are several large train stations. Looking for a good hotel in Rome? You'll definitely want to find one near public transit or close to the sites you plan to visit.